It is a serene Sunday evening in Woodlands, the megacourt is anything but. Apart from the usual buzz from basketball boys and frenzy from football aficionados, a group of 20 odd men are gathered. One is slamming a hammer on a tractor tyre while another is flipping a similar tyre; one is lifting a steel frame loaded with weights while another is dragging a steel sled loaded with men. Strength is in session. 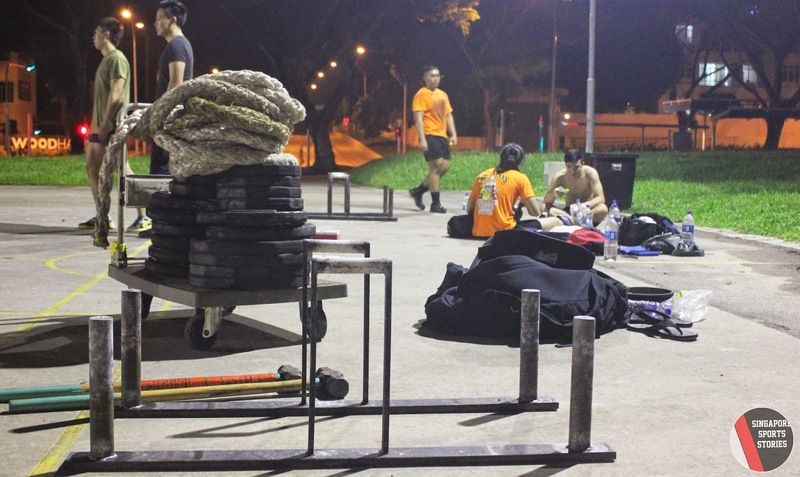 They are SG Titans, a strongman community in Singapore, and they are training using implements. The sport, strongman, first started in 1977 in Califonia, United States. Whereas weightlifters lift anthropometrically designed barbells and dumbbells, strongmen lift, pull, or even toss implements such as tyres, logs, kegs, cars, trucks, and even planes. Here in the megacourt, 39-year-old Goh Yeow Hui, or Ah Hui, as he is called by the titans, is strutting around the court, overseeing the training. He is coach as well as founding member of SG Titans. In 2008, all he had was a few “gym buddies” and one tyre. Today, he is one of over 300 members of SG Titans which now has a fair variety of implements. “When the numbers started to grow, we felt that there was a need to form a small community,” said Ah Hui. Back then, Ah Hui and his friends were training at Marsling industrial carpark working with what they had, a single tractor tyre. “It is a quiet place but that time we didn’t have any storeroom, we just placed our tyre at a lamppost,” said Ah Hui. Leaving it there got them a warning from the authorities and the tyre had to roll out. The next stop was Woodlands stadium where it was secretly stored with the help of a clandestine staff. Alas, the management found out and the tyre seemed destined for the dumpster. 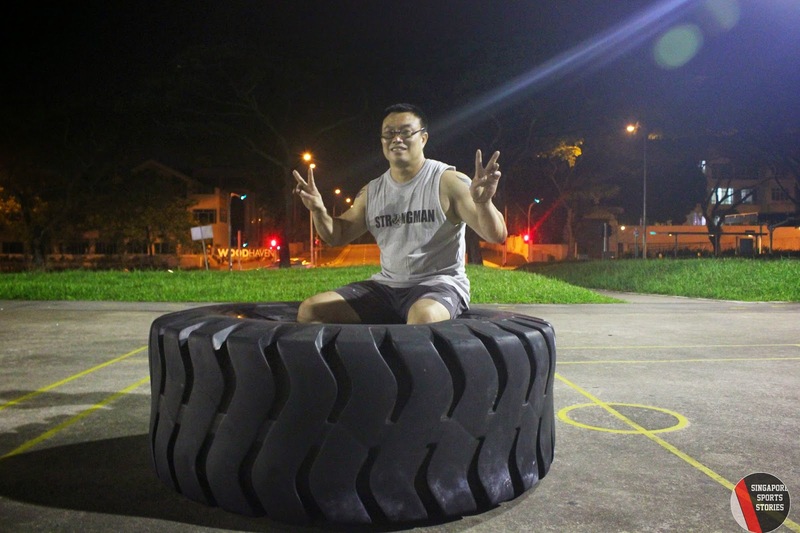 “Not said desperate lah, but I don’t want to lose this tyre, throwing it away is like a waste,” Ah Hui said. 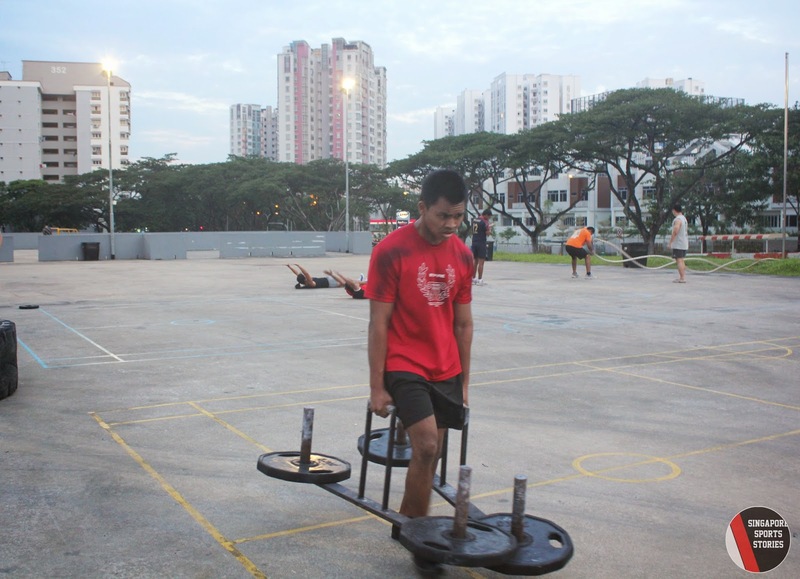 He enlisted the help of a friend who assisted in proposing strongman as a means of active living in the community to Marsling Community Sports Club (CSC) – SG Titans allows the public to join the sessions for free. It resonated with the CSC and they provided SG Titans with a storage space at a HDB block where the tyre would call home. Today, the tyre still gets flipped and thumped by hammers but it is accompanied by other implements, some custom-made. The 300 registered members are a mix of seasoned strongman and those new to the sport. Satyaraj, 25, has picked up the sport for about a year. “It is something you don’t do every day, something you don’t do in the gym or outside…on your own you cannot do this. You can only try to imitate the movement in the gym,” he said, panting from the tyre flips he just did. They were doing a circuit program that Ah Hui devised in which they had to clock in a number of repetitions for each station before moving on to the next one. Ahmad Taufiq Muhammad, who has represented Singapore internationally in strongman, grimaced and grunted as he pulled a sled with two chuckling strongman who seemed to have enjoyed the ride. “Currently, SG Titans has everything, if we were to run a competition, we can run it here,” said Taufiq, a SG Titans executive committee member. The current state is a far cry from the days in Marsling industrial carpark. Trainings are usually held twice a week without any pre-planned programmes or regimental regimes. Ah Hui said he has got the “blueprint” in his head. As the Sunday sky darkens and the floodlights begin illuminating the court, the strongmen are still at it. They do not know when the training ends or how it will end. “Sometimes it’s random, I surprise them,” said Ah Hui. 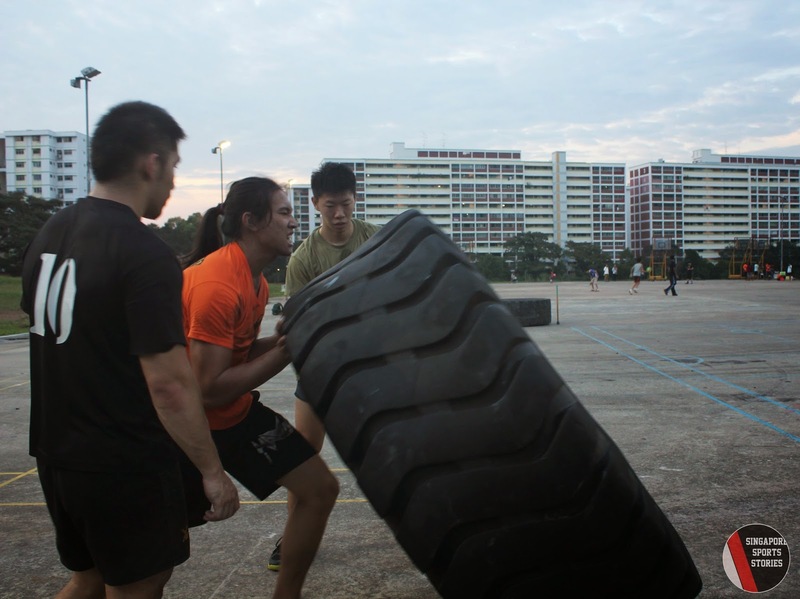 The spontaneity seems to work; four out of ten finalists for the recent HomeTeamNS Strongman Challenge 2014 were coached by Ah Hui. It is a draining sport, where strength is slowly sapped, slowing one down. “Eh, you are making a girl wait for you to finish the exercise.” Ah Hui said with a raised voice. On this Sunday, 26-year-old April Kong Min Qi is the sole strongwoman among the men. “Every once in a while, when I am free, I will come and train,” said April. The arts undergraduate is matching whatever the strongmen are doing; farmer’s walking the same weight, deadlifting the same weight and flipping the same huge tyre. 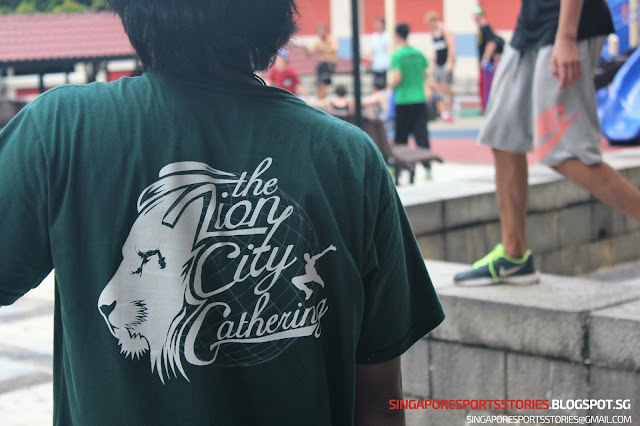 She picked up the sport this year and finished second in the first Singapore Strongman Classic 2014 in July. “Besides the fact that you are a girl and can lift heavy, it (strongman) pushes me to be more focused,” she said. As 10 p.m draws near, Ah Hui signals to pack up. The grunts and shouts begin to ebb, making way for casual chatter. They can relax now. With satisfied smiles and cheeky chortles, the dirt-stained strongmen know that training is over. They will roll the defining tyre not to a nearby lamppost but to its well-equipped home under the HDB.